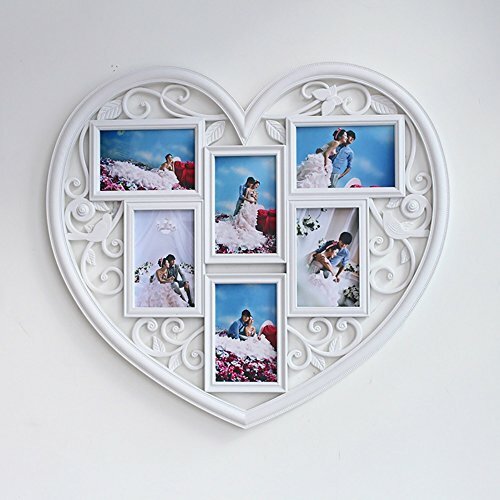 Photo wall composition size: Photo wall consists of six 10 * 15 cm multi-frame composition. Decorative accessories: Invisible S hook, invisible nail, with pictures, accounting for the wall area of 58 * 53 cm (frame interval adjusted according to the actual situation). Features: Easy to install Vertical and vertical metal hanging, easy to install on the wall, photo album DIY stitching. Bright modern geometric frames, various sizes of mix and match, clear layers, solid wood lacquer, crisp acrylic panels to protect your photos from abrasion. Favorite photo frame: Gifts to your family, office, studio or gallery, wedding engagement graduation, Valentine's Day Christmas New Year, relatives and friends of any occasion or festival.